Stand out from the crowd and turn your retail location into a destination for consumers. Gesture control interactive visual display systems are ideal for product advertising, retail merchandising and point-of-sale promotions. Turn any size store window, digital sign, wall, floor, cash counter or other surface into an interactive screen, an informative multi touch surface providing an entertaining 24-hour interactive billboard or portal to multi-media content (product info, advertising or games). For a portable, turnkey, plug and play interactive advertising and entertainment solution in retail environments check our Cube floor projection system. Procter & Gamble turned to GestureTek for the launch of P & G 5D Experience, a new concept store where people interact with and experiment with P & G's products using sensory experimentation. Hugo Boss Uses Interactive Screen GestureTek ScreenFX® for Retail Mall Advertising. A major consumer electronics manufacturer was looking to create a unique interactive consumer experience and they turned to systems integrator MTC Arscénique and Illuminate Multi-Touch Display technology from GestureTek. A GestureTek Multi-Touch Table with interactive content at an installation in Europe. WallFX delights kids at Childs’ Play activity center with Interactive Walls. Sony delights mall visitors with GroundFX interactive floor for retail. Stores use blue-tooth enabled multi-touch table for product marketing. Stringnet Media, Peru Supermarket Aisle. Retailer Musgo makes play for hearts and minds of shoppers with interactive gesture-controlled games on their retail window. Intel launched a promotion for the Centrino Duo processor using GestureTek’s cutting edge interactive table technology to integrate product excitement. GestureTek and Imagination USA installed and interactive surface computing table for Samsung delivering a motion-controlled wayfinding experience. 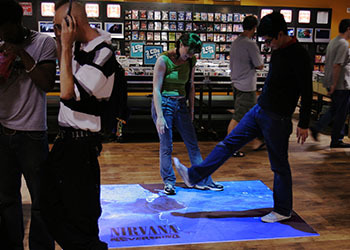 GroundFX® interactive motion controlled floor entertains store patrons and sells product at the same time. GestureXtreme interactive virtual gaming system were installed in several Children’s Place locations across North America to the delight of children and adults alike. GestTrack technology was used for the Nike retail trade exhibit. Consumers could try on virtual clothing, changing the outfits and the background with hand gestures. GroundFX® used as interactive retail signage to drive store traffic and advertise albums. Charlestown Mall in Dublin, Ireland proudly boasts one of the largest and most interesting interactive retail signge systems in Europe, thanks to ScreenFX technology. Target advertised on the streets of New York using GestureTek’s WallFX™ technology on a gigantic interactive billboard.